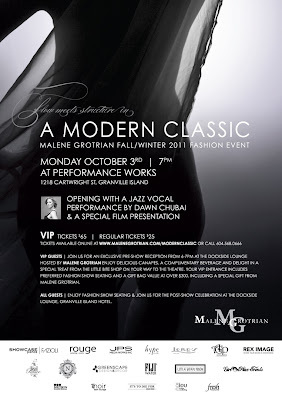 Join one of my favourite local designers, Malene Grotrian, for the launch of her new fall/winter 2011 collection. Titled "A Modern Classic," the collection is all about flow and structure. Check out the flyer above for details (click to enlarge), or purchase your tickets here. UPDATED TO ADD: You have a chance to win a pair of VIP tickets here. Looks like its gonna be fun! Wish I could go.